No one feature makes the LayoutEditor unique. 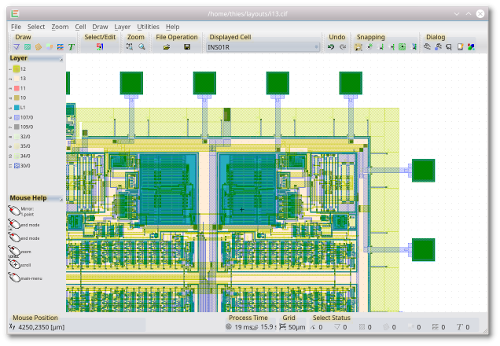 There are many small things which make the LayoutEditor different from other programs and turns it to a distinctively versatile tool when editing layouts for IC, MEMS, MCM, PCB, COB, MMIC, LTCC, ... Prepare to be impressed! A cleverly worked out user interface provides outstanding usability on the one hand and high productivity on the other. This virtual challenge is solved by the extensive use of shortcuts and mouse button/key combinations together with clear display of these combinations. The most important handling functions like zooming and scrolling are integrated into each feature and need not be called up separately. Validating the design rules is an important point in the design flow. The LayoutEditor has a integrated Design Rule Checker with many different rules checks. The violations are not only display in a list, but directly visualized within the design. 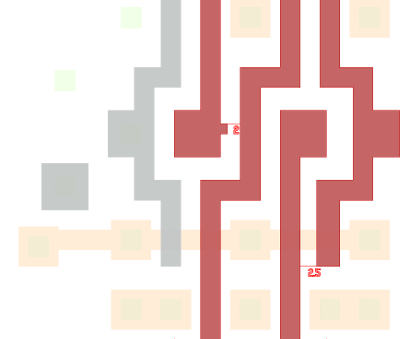 As a matter of course all design rule checks work on all angle elements and is not limited to common Integrated Circuit checks. As a matter of course macros or scripts are possible with the LayoutEditor. It can be used for different applications. So, with the LayoutEditor it is possible to record macros from the user interface like some office programs can do. This makes creating macros very simple and reduces the time to learn programming a lot. Macros are written in the most common language C/C++. Macros can be added in the menu structure for a perfect integration of own created extension. A wide range of ready to use macros can be download at our macro market. Via LayoutEditor python module you can embed the LayoutEditor as a off screen tool or with its graphical user interface in your own Python application. As designs can extend to several Gb in file size, perfomance is an important factor. All significant features of the LayoutEditor are optimized to handle huge designs. So for example multi Gb GDSII files can be loaded in seconds. Also the painting performance is excellent and can easily compete with any other tool. Medium sized designs (up to several hundred MB of GDS file size, exact size may depend on the design) can be painted with all details in real time. With bigger designs a lack of performance is automatically detected and scarcely visible details are omitted. So even huge designs are painted with a acceptable performance. Once a design is finished photomasks are required to produce the device you have designed. The LayoutEditor will also help you in this area. 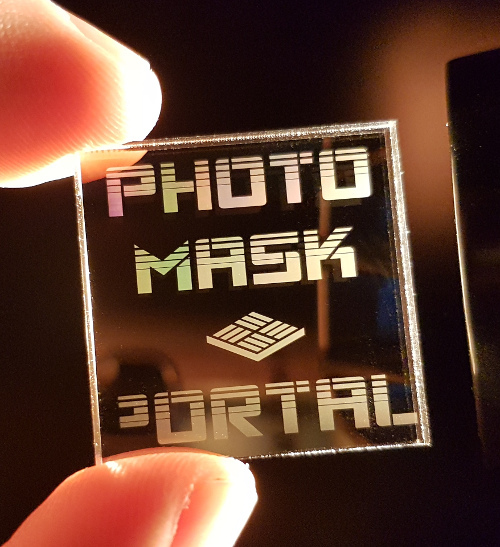 With the build-in photomask service you will have access to photomask production facilities around the globe for high quality photomasks of any kind. A two dimensional designing can sometimes be quit abstract. The LayoutEditor allows a fast three dimensional visualization for your design. A setup can be done in few seconds. The 3D model/3D view can be exported and used for example for a FEM-analysis. 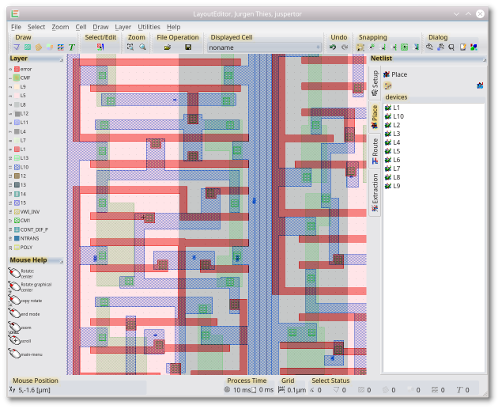 is integrated in the LayoutEditor for creation of electrical circuits and parametric layout. The SchematicEditor is designed for versatile use: almost every simulatior can be used, common file formats are supported and of course a very comfortable schematic driven layout.